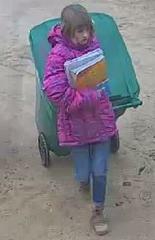 CCPD SEEKS YOUR HELP IN LOCATING A MISSING CHILD: RILEY, 11 YEAR OLD WHITE FEMALE, 4', 80LBS, SHORT BLONDE HAIR, BLUE EYES. LAST SEEN IN THE DESERT BETWEEN CAL CITY HIGH SCHOOL AND THE AIRPORT. RILEY IS WEARING A PUFFY PINK COAT, JEANS AND TAN BOOTS. SHE MAY BE ATTEMPTING TO REACH HIGHWAY 14 WITH A DESTINATION OF LANCASTER. 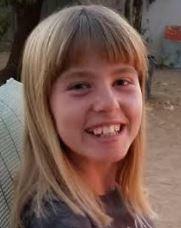 IF YOU HAVE ANY INFORMATION THAT CAN ASSIST IN HELPING SAFELY LOCATE RILEY, PLEASE CALL 911 OR 760-373-8606.